Nuclear weaponry (and its use) hardly make for light reading. It's August--last night I witnessed a bio-luminescent comb jelly lighting up the beach as it was tossed about in the waves. Today I saw an ibis mucking about a mudflat at low tide. Life remains wondrously awesome, despite the behavior of H. sapiens. So we're mortal; we screw up. When things get tough, the tough turn to xkcd, a comic strip by Randall Munroe, a physicist who gets sidetracked by life, and puts it in comics. Makes me think maybe we're a step above wasps. 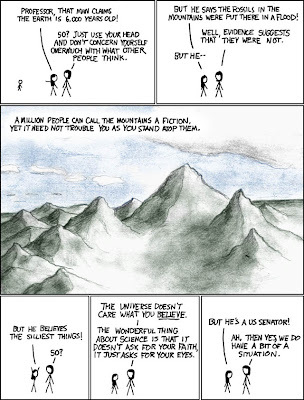 Randall Munroe lets folks use xkcd for noncommercial purposes, as long as it's attributed and not overdone. Thanks, Randall! A good cartoon, but a key difference: Ann Telnaes, the artist, does not freely share her work (nor do I think she necessarily should). I am not sure it should matter, but I have images floating around in my brain, Travelers sitting around a campfire sharing stories and songs and life. The stories matter more than their origins. The stories define us. So a nickel or two to Ann, and a "God bless," but I'm sticking to my roots. (All I need now is a bumper sticker proclaiming "Proud to be a Gypsy." That's a big distinction, Michael - the willingness to share vs the desire not to. I think it's part of what makes good teachers tick. I recently had a twitter conversation with someone about linux, ubuntu in particular. He asked me - but have you seen Windows 7 yet? And I replied that linux (ubuntu in particular) has a philosophy of sharing and as such is the only ethical way I can compute. A bit soap-boxy now that I think about it but that's the soap box I choose to stand on and I'm comfortable with that. I enjoy using a Mac. I can really see some benefits to such a smooth user interface. But I love Linux. I run Puppy on a really old computer and I run Ubuntu on everything else. Now that I'm teaching computers, I'm going to dual boot the Macs to use Ubuntu as well. Linux is effective and quick and when I need help, the forums are amazing. It is, indeed, a big difference. I use linux on my desktop, recently bought a laptop, and may switch to it there, too. I may be picking your brains on puppy--I have a really old laptop, and I'm tempted to resuscitate it. If I had a working OS on it, I could hand it off in good conscience.